This discontinued 3.75 inch Today's New Star Betty Boop polyvinyl figurine is ready to go out dressed in a red formal evening gown, a white boa, a large gray and pink hat, and red loop earrings. She stands on a molded yellow base. The figure was introduced in 1986 by Marty Toys, or M-Toy, and marketed until 1995 when Marty Toys lost the license. This is an elegant, attractive figure of a cultural icon and cartoon favorite. 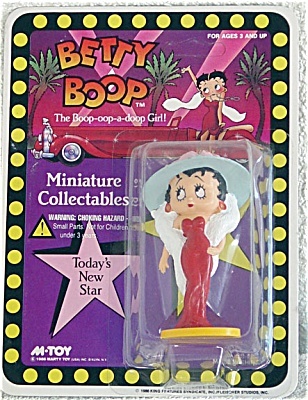 This pretty Betty Boop figurine is new and mint-in-the-package.